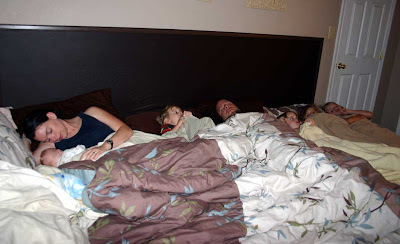 I have been asked over the years how we work out our co-sleeping arrangement with all the kids in 1 bed. Right now we have all 5 in the bed with us (pictures below). The older 3 (5,7, and 9) would probably be fine sleeping in another room together if we encouraged them to do so. They often do when they have friends over and they LOVE camping out in the living room, just the 3 of them. But their room is upstairs and ours is downstairs and I am not comfortable with them so far away at night (keep thinking, what if there was a fire or something? I need to be able to get to them quickly). They don't seem too keen on sleeping on another floor either, and often, even if they have a friend over, 1 or 2 of them ends up back downstairs with us. So right now they still sleep with us. When we move in the near future and their room is across the hall, we will probably encourage them to sleep there if they feel they are ready. But they are always welcome in the bed with us anytime. I LOVE co-sleeping! There is nothing like a big bed full of people all snuggled together . . . so cozy!! It took me about 6mo to get used to it after Xian was born. I never slept with anyone as a kid, not until I got married did I share a bed. Even as a kid, the short time I shared a room with my sister we had bunk beds. In high school I slept sideways on my bed, I loved to spread out. But it didn't take long to get used sharing my space with others. Charlie seems to enjoy co-sleeping too (he isn't much of a talker but has never complained and occasionally when he doesn't know I'm looking I'll see him looking at a sleeping baby next to him in the bed with a smile on his face). Yes, we get kicked in the head often (several of the kids are VERY wiggly) and yes I often have a kid lying on top of me at any point in the night. Sometimes you wake to find that someone has flipped completely around and their feet are in your face, LOL! but you get used to it. When Xian was born we had a co-sleeper. I never used it. Well I did use it to hold my water and diapers, but he slept next to me. Depending on what side I needed to nurse him on, he would either be next to the co-sleeper or between Charlie and I (I would just move him at night as needed). We had a queen size bed then and it was big enough. When Arah came along we built a frame next to the bed that would hold a crib mattress and make it flush with the bed so that it was level, like an extension of the bed. Xian moved over there, on the other side of Charlie, Piper moved to the middle between us, and Arah was on the end. Are you picking up a pattern here? LOL!! Everyone rotates when a new baby comes (usually I move them a month or so before the baby comes, so they get used to their new spot). So when Ever was born we replaced the crib mattress with a twin mattress and pushed up flush with our king sized bed. Xian moved to the end of the bed, Piper moved to between Charlie and Xian, then Arah was in the middle and Ever on the other side of me. Piper and Xian were both on the twin bed, though Piper usually ended up on top of Charlie (she really likes to cuddle). I was not sure if we would all fit when Thrace came along, but we do! Xian is on the end, Piper is in the middle and Arah is next to Charlie (usually he is like in the crack between the twin mattress and the king, and he also likes to cuddle). Ever is between me and Charlie and Thrace on the other side of me. I had pictures of everyone asleep in the bed, except me, so I had my mother in law take some pictures of all of us shortly after Thrace was born. This works great for us. We are all used to lying close to each other and the kids think nothing of it. They are also used to random noises at night (like a baby crying) or Charlie getting up earlier or whatever and typically they sleep right through it (though Xian will often get up earlier if Charlie does, they all don't) or if they wake they promptly go back to sleep no problem. There is really nothing sweeter than crawling into a bed full of sleeping kids. Sometimes I walk in and see them sleeping with their arms around each other. Right now I am sitting in bed typing this with them all asleep around me (Xian just mumbled something . . . he is always talking in his sleep, and Piper rolled over and cuddled up with Arah). I know it may seem inconvenient. It has been years since I have been able to cuddle with Charlie. But the way I look at it . . . the kids are only small for a short time. They only need us like this for a short time. They grow up and move on so quickly and considering how busy the day can get, it is nice to spend every minute with them, even if it is the middle of the night. And frankly it doesn't get any more peaceful than this with everyone in 1 room, LOL!! Plus if they need anything, if they wake from a bad dream, if they are feeling sick (like Piper just a while ago woke to tell me she had a stuffy nose, then she promptly went back to sleep . . . I think she is catching my cold) then we are right there. I remember a handful of times crawling into bed with my parents at night after a bad dream. I never felt so safe! I love the security it provides them while they are little and need us. I love how it brings us close together. I will enjoy being able to stretch out in the bed again some day, not being woken multiple times at night, being able to cuddle with an adult again. But for now I am loving this stage of life with little ones in the bed and I am trying to cherish it as long as it lasts. Besides, after the kids are grown Charlie and I have the rest of our lives to spread out in this big bed. OK to recap . . . how we make it work . . .
We have a King size bed, the mattress sits on the boxsprings on the floor. Considering they are all around 2 yrs apart, each kid gets approx 4 yrs sleeping next to me (from newborn to age 4) and 4 yrs next to Charlie (from age 2-6) and 2 yrs sleeping between the 2 of us . . . wouldn't you have loved that as a kid!! I always wanted to co-sleep with my babies when they came but DD never liked sharing (independant even as a newborn!) so she was soon in her own bed and later her own room. Then when DS came along he lived co-sleeping but as soon as he was able to voice a peferance asked to be in a room with his sister, so that was that, our co-sleeping days over! Oh man that is a fear of mine, LOL! That I will have a baby that prefers to sleep alone. I have heard of babies like that but I think it is still pretty rare (it is natural for them to want to be close to us). I don't know that I could sleep well without my baby next to me, it would be SO hard! LOVE IT!! Thanks for sharing the 'normal' side to this life too. We are just starting our bus conversion to live in with the six kiddos, and we are getting quite a few comments on 'privacy' issues, and "won't we feel trapped". It just makes us smile, because we can't think of anything better while they are still young and WANT to be hanging around us. Close and snuggly, and only little once. Luvs to you and yours Kelley. Thanks so much for sharing this. I'm loving cosleeping with my 3 month old more than I could have ever imagined, and already concerned about how it will work when we have more. Reading this was encouraging! I love that you created a solution to enable your whole family to share sleep. What a gift to give your children. Beautiful! and great that you got some pictures as well. I don't think we have any pictures of all 3 of us in bed - only got a couple of cute "daddy and baby" sleeping ones. Love the pictures!!! While I'm an independent sleeper and so are all 3 of my kids (I need my space, and my kids have always slept best on their own), I love that you guys love it so much and make it work so well! I co-slept strangely for 10 months. By strangely I mean that for 4 months, he was always in my bed. I then moved him to the crib but 3-4 hours later he came back to bed with me to nurse and would stay there all night. Then when he started to get mobile I would usually nurse him in the rocking chair at night. Most nights I was too tired to do this and brought him back to bed. Unfortunatly my bf is a sleep walker and DS is a wiggler at night. I would put DS next to me and wake up to find him on the other side, next to his daddy. It was cute most of the time but too often my bf would roll on him and not hear DS cry. It became way to dangerous to keep him in our bed, so he became a permenant night caged baby. Maybe next kiddo we can invest into a king size bed. omg! that looks unbelievable!! but liked it. isn't it difficult sleep with 6 people in the bed? don't you ever sleep alone with your husband? don't you need it? It is actually 7 in the bed! I think it is mostly about your outlook and expectations (or lack there of). I grew up sleeping alone (was the middle of 5 and had my own room, the others shared). So I was used to spreading out and lying in my double sized bed any way I wanted. On the other hand I also remember being scared as a child, that I was alone at night (even though I had done it since I was a baby) and I remember nights being a lonely period, though when I was older I loved the space. I had to get used to sleeping with dh when we got married. It isn't much different from that. I believe in keeping them close, I believe it is best for them to move out on their own when they are ready to be separated and to be available to them while they are little. It is SO much easier to co-sleep with a nursing infant (I hardly wake up at night to nurse them). But it did take some time to get used to. I didn't have any expectations of it being any way, I just did it because I felt it was best and made adjustments where needed, same with dh. My older 2 have been sleeping in another room lately (though sometimes they still choose to sleep with us). My 3rd sometimes stays with them but often ends up back with us (he isn't quite ready yet it appears). My oldest, who is almost 10, would be fine sleeping in a room on his own now and he is welcome to do it if he wants. He likes to spread out at times but doesn't mind sharing a bed either. Bottom line is that it is HE who is choosing it, not me forcing him to sleep alone.